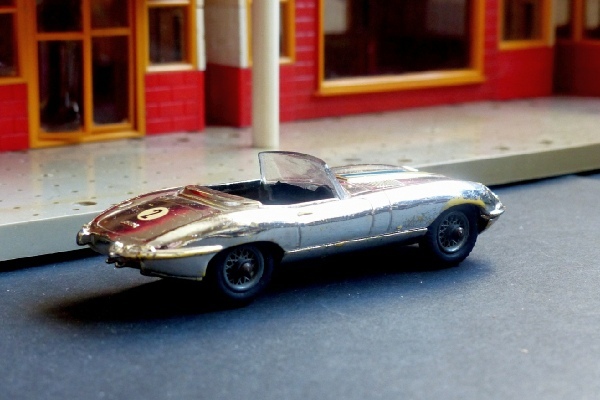 A silver plated version of the Jaguar E Type with #2 decals and a blue bonnet strip. This was produced only with spoked wheels and would have come with a racing driver behind the wheel. I will have one somewhere and will include him in the sale. This is in very good condition. The silver paint is particularly vulnerable to chips and beneath it is a strange beige colour which shows through annoyingly! Having said that, as you’ll see in most photos, the marks don’t show on display at most angles. It is a nice model and comes with its original box which is in good condition and complete.